There was a time when I felt I could never own a non-stick skillet that would last for a long time. They'd either get scratched and stripped, it drove me nuts. It ended up being true, I'd have limited luck with non-stick cookware. But they were convenient or so I thought until I picked up my first cast iron skillet some odd seven years ago.My skillet is probably one of the most abused pieces of cookware I own, I often start my day with it (eggs at breakfast) and then end up cooking dinner in it almost every other day. I've even used it as a weight to make pressed sandwiches and squeeze the liquid out of paneer, there's a lot that this marvelous beast can achieve. This savory tart is easy and I took a couple of liberties with the original recipe in the book. I skipped the bacon and used olive oil. The onions get caramelized in the skillet and simultaneiusly get infused with the delicious flavor of nigella seeds. Add some creamy goat cheese and pears and this is one delicious tart - dinner or as a snack! 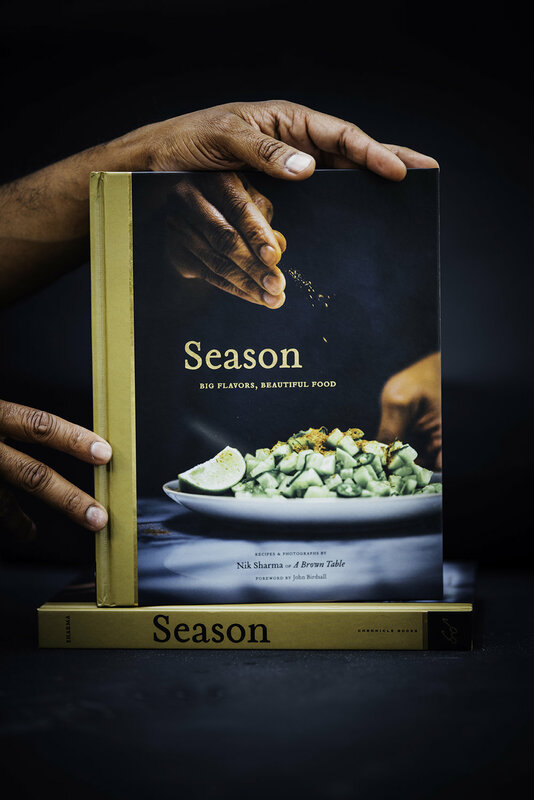 The kind folks at America's Test Kitchen are helping me give away a copy of this lovely book to one lucky reader from here. All you need to do is leave a comment below sharing what you would love to learn to make with your cast iron pan. The contest will run from a week from May 20 to May 26th, 2016. The contest is only open to legal US residents and please don't forget to leave your email so I can directly contact you! Good luck and happy cooking! Use good quality pears in this recipe. I've substituted chives with the green part of scallions. Either works well. Nigella seeds are tiny black seeds, you should be able to find them in most Indian or International grocery stores or even the International aisle section. 1. Adjust oven rack to upper middle-position and heat oven to 350 degrees. Heat 2 tablespoons of olive oil in a 12 inch cast-iron skillet on medium-high heat. Add the onions, nigella, salt and pepper, cover and cook, stirring occasionally, until onions are softened, about 8 to 10minutes. Uncover and continue to cook, stirring occasionally, until onions are deep golden , about 10 minutes. Stir in vinegar and cook, until almost completely evaporated, about 2 minutes; transfer to the bowl. 2. Wipe the skillet clean with a paper towel and then grease with remaining 1 tablespoon of olive oil. Place the pizza dough on a lightly floured counter, divide in half and cover with greased plastic wrap. Press and roll 1 piece of dough (keep remaining dough covered) into 11-inch round. Transfer the dough to the prepared skillet and gently push it to the corners of the pan. Spread half of the onion mixture over the dough, leaving a 1/2 inch border around the edge. Scatter half of the pear and 1/2 cup goat cheese evenly over the top. 3. Set skillet over medium-high heat and cook until the outside edge of the dough is set, tart is lightly puffed, and bottom crust is spotty brown when gently lifted with the spatula, 2 to 4 minutes. Transfer skillet to oven and bake until edge of the tart is golden brown, 7 to 10 minutes. 5. Using potholders, remove skillet from oven and slide tart onto wire rack; let cool slightly. Being careful of hot skillet handle, repeat with remaining 1 tablespoon olive oil, dough and toppings. Sprinkle tarts with chives/scallions and cut into wedges. Serve. 1. Pulse flour, yeast, and salt together in a food processor to combine, about 5 pulses. With processor running, add oil, then water, and process until rough ball forms, 30 to 40 seconds. Let dough rest for 2 minutes, then process for 30 seconds longer. (If after 30 seconds dough is very sticky and clings to blade, add extra flour as needed). 2. Transfer dough to lightly floured counter and knead by hand to form a smooth, round ball, about 1 minute. Place dough in large, lightly greased bowl, cover tightly with greased plastic wrap, and let rise until doubled in size, 1 to 1 1/2 hours. (Alternatively dough can be refrigerated for at least 8 hours or up to 16 hours).